Relative Sustainability is a more useful concept than Absolute Sustainability. A city with high inputs (of energy, food, water etc.) and high outputs (of thermal pollution, sewage, vegetable waste etc.) is relatively less sustainable than a city of the same size but with lower levels of input and output. Improving the relative sustainability of an urban landscape requires an evaluation of those features which affect the pattern of inputs and outputs. This is likely to include earth, water, vegetation, building types, transport systems and spatial organisation. One can then assess the potential for change through landscape planning. Two of the main challenges are the attainment of sustainable landscape objectives in the densely built city core, which is often historic, and the need to engage communities in a desire for sustainable cities and the consequent changes that will ensue. The achievement of sustainability objectives, in cities which were built on less-sustainable principles, is a complex process. The social, physical and biological systems in urban areas are as complex as natural systems. Sustainability planners need to study, model and make proposals for the urban landscape at all scales and levels, in time and space, and beyond the usual span of three generations. To ‘sustain’ means to keep going. When a musical note is played, the meaning is unmistakable. With reference to landscape planning, it is unclear. On a geological time scale, mountains rise and fall, species evolve and become extinct. The ant has sustained its physical form and way of life for hundreds of millions of years. What would it mean for a human society to be sustainable? Affordability, Sustainability and Solubility have meaning only in defined circumstances. Salt is soluble in water but not in oil. A house can be non-affordable for most of us but easily purchased from Bill Gates’ pocket money. Sustainability makes sense only as a comparative. Labelling one city, or land use practice, ‘sustainable’ and another as ‘non-sustainable’ is meaningless. The illustration below, reproduced from an essay on Eco-Cities in Tom Turner's City as landscape illustrates the concept of relative sustainability. A city with high inputs (of energy, food, water etc.) and high outputs (of thermal pollution, sewage, vegetable waste etc.) 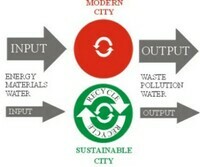 is less sustainable than a city of the same size but with lower levels of input and output. This usage accords with the circumstances in which the concept of sustainability was introduced, in the 1970s. The world was thought to be running out of resources. It hasn't happened on the input side. But rich societies’ hatred of pollution has grown and provides a strong reason for making our towns more ‘sustainable’ in the defined sense. Improving the relative sustainability of a city requires an evaluation of those features which affect its pattern of inputs and outputs. This is likely to include earth, water, vegetation, building types, transport systems and spatial organisation. One can then assess the potential for change through landscape planning. Two of the main challenges are the attainment of sustainable landscape objectives in the densely built city core, which is often historic, and the need to engage communities in a desire for sustainable cities and the consequent changes that will ensue. The achievement of sustainability objectives, in cities which were built on less-sustainable principles, is a complex process. The social, physical and biological systems in urban areas are as complex as natural systems. Sustainability planners need to study, model and make proposals for the urban landscape at all scales and levels, in time and space, and beyond the usual span of three generations. The Sanskrit word dharma, derived from the root dhr meaning to hold up, to carry, to bear, or to sustain has been the basis of Hindu society at least since Vedic times. The word dharma, often translated as 'natural law' refers to that which sustains (or upholds) nature and the universe. Human society is sustained by the dharma, here meaning 'natural duty' performed by its members. For example, parents care for their children, a king protects his people, a society conserves its environment. North American society is comparatively less sustainable than European society. Porritt, J. 1984. Seeing green: the politics of ecology explained. Oxford: Blackwell. Royal Society for the Protection of Birds, 1994 New rivers and wildlife handbook Sandy:RSPB. Spirn, A.W. 1984. The granite garden. New York:Basic Books.